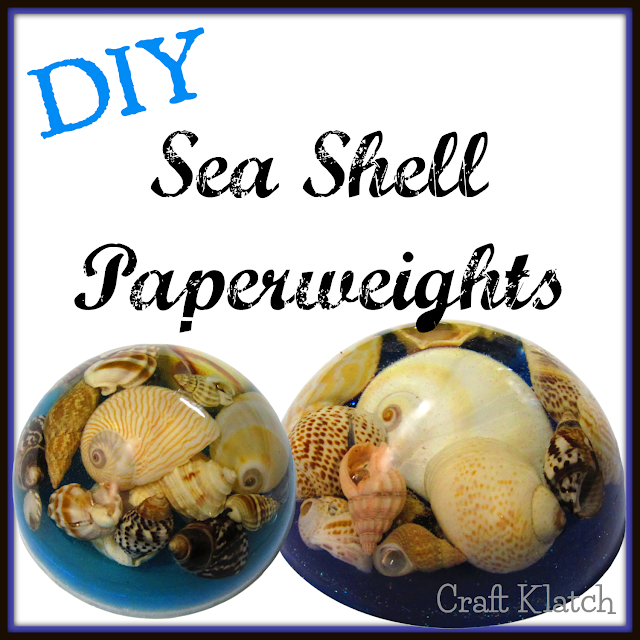 Create an easy resin sea shell paperweight. A great addition to your beachy decor, I will show you how to make it in this DIY craft tutorial! 1. Mix a little bit of your resin, according to the package directions. If you have some leftovers, this is a good time to use it. Pour a little bit into the mold. 2. Pop bubbles with your lighter and let it cure around 12 hours. 3. Mix more resin (1/2 ounce to an ounce) and mix your shells into the resin. Make sure they are well covered. 4. Scoop the resin covered shells into the mold and then pour the remaining resin in as well. 5. Pop bubbles with your lighter. 7. Mix enough resin to cover the shells - pop bubbles and let it cure. 8. Mix a little bit of resin and add a drop of the transparent blue pigment. 9. Add some Glamour Dust. 10. Pour into the mold. This should finish off the rest of the mold and the shells should be fully covered. Pop bubbles and let it cure a minimum of 12 hours. You can take it out of the mold and marvel at your beautiful new paperweight! You might like it so much that you won't want to give it away! Thank you for stopping by! Remember: Life's too short not to shimmer, so grab your glue gun and your glitter!™ Stay safe! Seems a bit complicated, but I like it enough to try it!